It’s been a long road, and technically Season Three isn’t over yet, but it may as well be for me. I achieved what I set out to do. I am omitting some of the games that I played in this Promotion Series because I don’t want to build up stress or tension for anyone else. 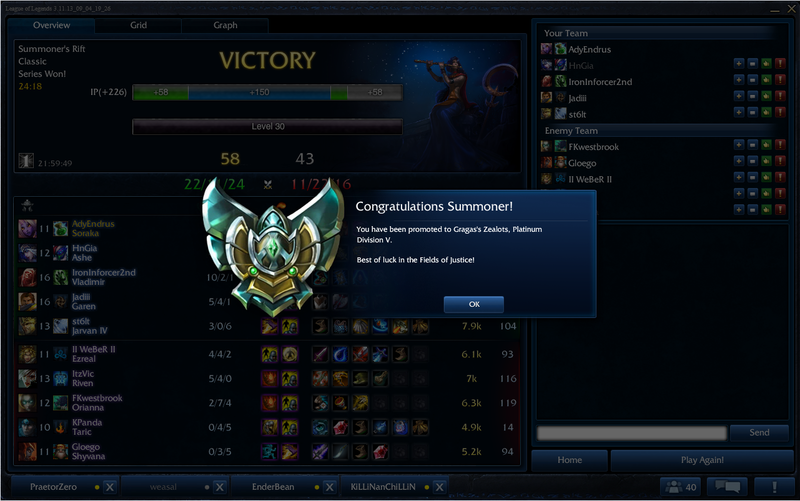 Instead I’ll just focus on the good times and show you happy players in happy Platinum. By this point everyone on both teams is in Platinum. Well, everyone except me. Our mid laner decided to play as AP Janna. I checked his history and ranked stats and he had never played Janna in Season Three. That’s no big deal, it’s still a solid strategy against a Twisted Fate. If you just push TF into his turret he can’t roam around and get kills in other lanes. This Janna executed that perfectly. We ended up dominating in this game. Fiora became a wonderful target for my healing, and we won one team fight and the game was over. In my last Promotion Series game I ended up picking Soraka again. The lanes I would have played were picked already and I respected the pick order. I grabbed Soraka. 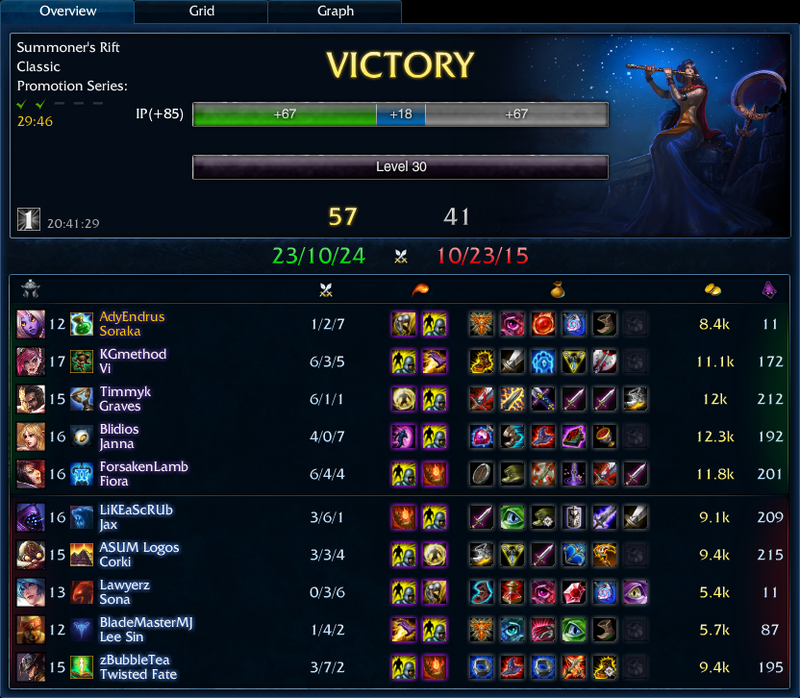 We had a Vladimir, a Garen, and a Jarvan IV, so someone suggested that HnGia play Ashe or Varus instead of Corki. I wanted Corki so bad! Corki and Soraka?? That’s a bot lane made in heaven! I give you endless mana, you spam your endless mana! All the damages! Oh well, endless mana is still cool on Ashe I guess. Our bot lane was just about irrelevant. By the time we got out of laning phase Garen was sprinting the outer wall of the enemy team’s base, just slaughtering their entire team. I don’t think his chat was working, because when we moved on an objective or tried to organize a team fight he wouldn’t really cooperate. I’ve had worse team mates, because at least this guy was winning lane. Then Vladimir got out of hand. The fine print on Vladimir’s E says that “Soraka’s heals become bananas.” I was healing that ugly vampire for ~500 health with each W. With that extra armor buff Ezreal, Riven, and Shyvana couldn’t touch him, especially through the amount he was spell vamping. 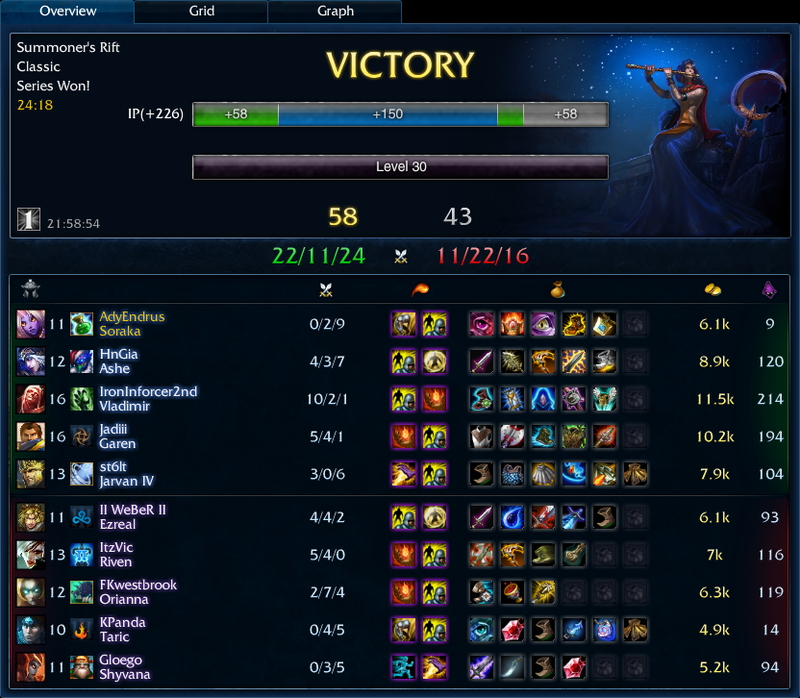 We had a solid team, and I’m pretty sure we crushed their Nexus with bananas before they could surrender. I was pretty thrilled to see this!